It’s that time again, that time when we’ve made Stock Rover better and included a whole bunch of new features in version 3.0. As always, the changes we’ve made are largely based on suggestions from you, our users, as well as on our own long-term vision of the product. Note that some of these features will eventually be available only to paid subscribers once we switch to that model in the fall, and I’ll point those out. But for now, enjoy them freely! You can now organize your portfolios into subfolders. 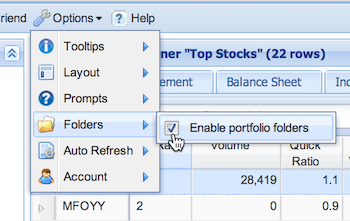 Here’s how it works: first, go to Options → Folders and check the box for Enable portfolio folders. This will place all your portfolios in the Default subfolder From there, right-click either “My Portfolios” or the Default subfolder, select “Create Folder” from the drop-down menu, and then give the new folder a name. Then you can drag your portfolios into the different folders; you can also drag and drop the subfolders to rearrange their order. You can also rename the Default subfolder to whatever you like. If you want to temporarily disable the folders feature, just go back to the options menu and uncheck the box. Don’t worry, this will not get rid of your folder organization! 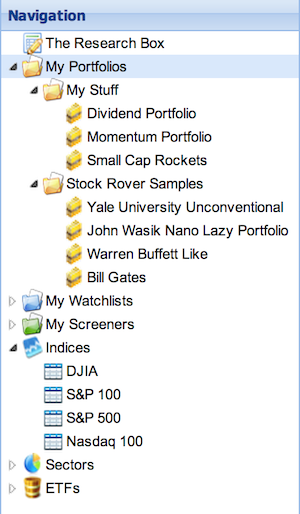 Next time you enable folders, your portfolios will be organized just as you left them. Think of the enable/disable portfolio folders as simply a view option that you can easily control from the Options menu. 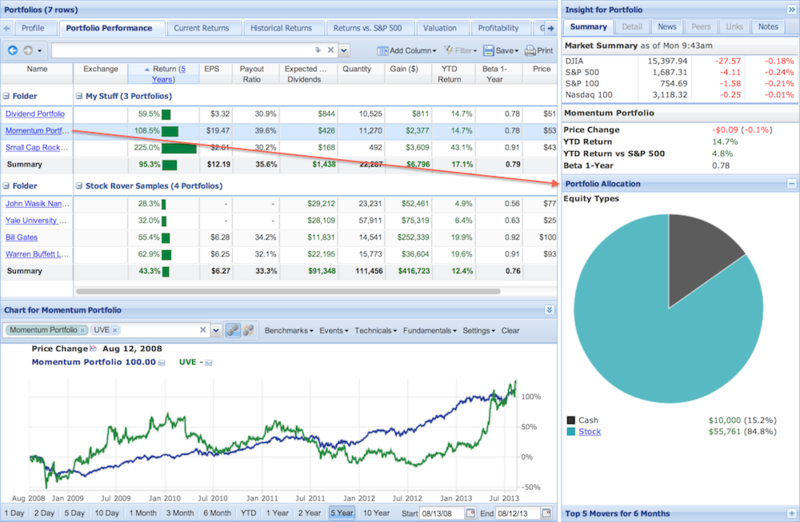 You can now see the breakdown of equity allocation for all of your portfolios in a visual format. To see the allocation pie chart, you’ll need to have a portfolio displayed in the Insight Panel. To do that, first click ldquo;My Portfolios” in the Navigation panel so that all your portfolios are listed in the Table. Then select the row of the portfolio you want to see in the Insight Panel (just select the row, don’t click the hyperlinked name) and you’ll see that the Summary tab in the Insight panel now has a Portfolio Allocation section, which has a few layers of allocation information analysis. First, you’ll see the breakdown of equity type for the portfolio (shown above). 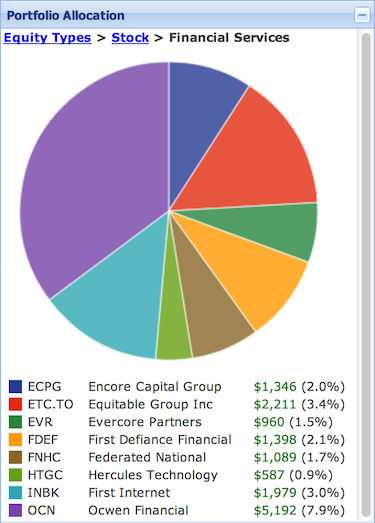 But you can click down further to see the breakdown of your holdings within that equity type. So, for example, if you click “Stock” then you’ll see the sector breakdown of your holdings. You can keep following the links down into the allocation of industries of your portfolio, then the stocks within those industries. The breadcrumb trail can help lead you back up to the larger categories. 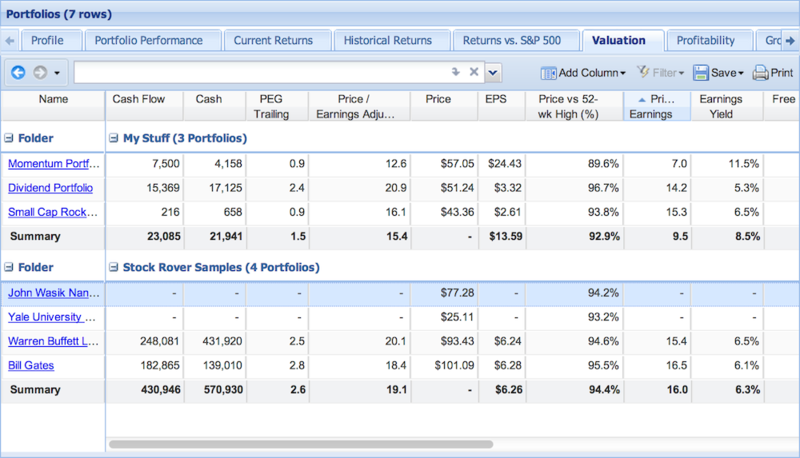 The screener no longer limits the number of returned stocks to 250, so you can now page through thousands of tickers. So go! Screen! Then page to your heart’s content. The chart now goes back 10 years, for both pricing data and fundamental data. So now we can more clearly see the full horror of the great recession. 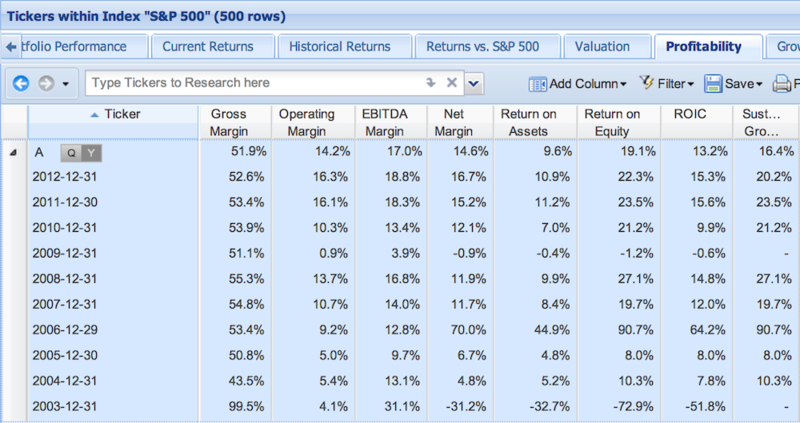 You’ll also see ten years of data if you expand a ticker in the Table (below), and in the Detail tab of the Insight panel. This is one of those features that will be only available to paid subscribers in the future, but for now you’re free to dig into the early ’00s as deep as you’d like. 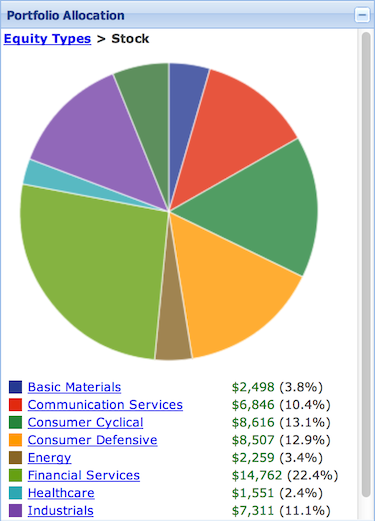 If you click the Fundamentals menu in the Chart, you’ll notice that the Chart just got a whole lot fancier. Now, not only can you chart over 100 metrics and keep a quick list of your favorites, you can also chart several fundamentals at once by bundling them together into a metric package! 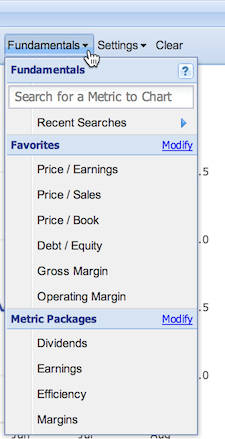 You can modify your favorites list and your metric packages by clicking the Modify links in the drop-down menu. 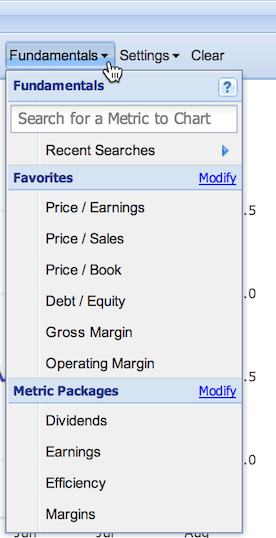 As always, you can add any of these metrics to the Table through the “Add Column” button in the Table’s toolbar. 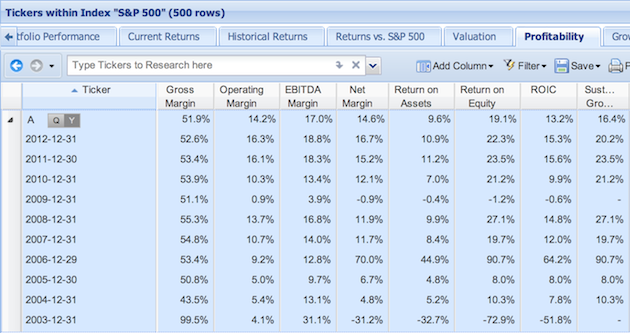 We have created a new view called “Historical Valuation” that will demonstrate many of these new metrics. For existing users, the new view was added automatically to your view set. We also support over 1000 Market Funds, which means you can view their data in the Table, as well as add them to portfolios. Under the “Events” menu in the Chart you can add the Max Drawdown to the chart. This will draw a down-facing arrow where the charted item had its biggest peak-to-trough decline during the charted period. 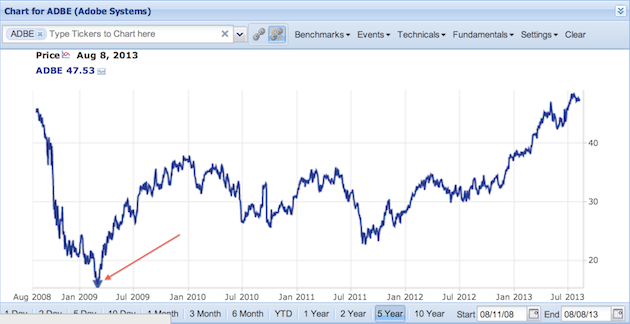 If you mouse over the arrow, a tooltip will show the magnitude and the date of the maximum drawdown. You can see it down there nestled right in the crux between abject despair and buoyant optimism. 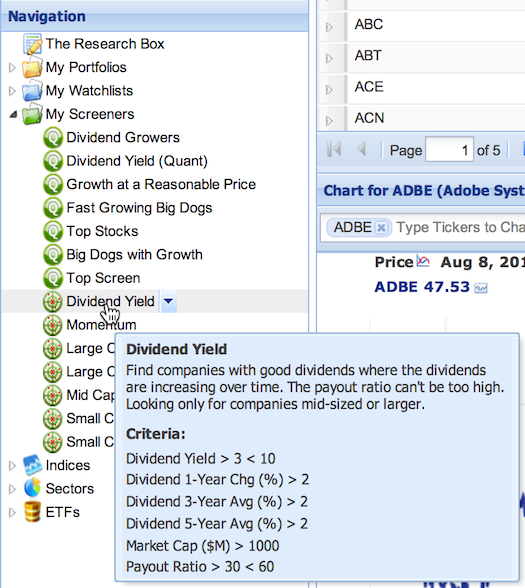 Forget exactly what your Dividend Yield screener criteria were? You no longer have to go through to the Task Wizard or the Screener Manager in order to refresh your memory. Now, if you check the box to show screener tooltips in the Options→Tooltips menu, you can just mouseover the screener in the Navigation panel to get a pop-up tooltip showing the screener’s criteria. You can now rank your Watchlists according to your ranked screener criteria (previously, you could only rank a portfolio.) This works almost identically to ranking portfolios, so head on over to the help pages to see how it’s done. You can now select what type of emails you want to receive from Stock Rover directly from your account. 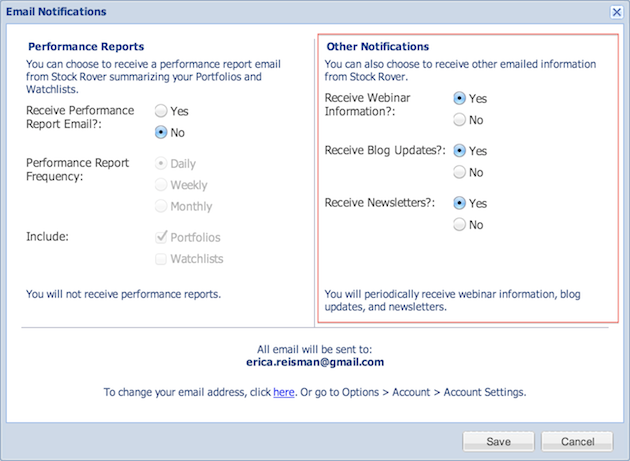 Just go to Options → Account → Email Notifications and you’ll be presented with a dialog window where not only can you elect to receive performance reports, but also choose what sort of Stock Rover emails you want to receive. The default is that you are signed up for all Stock Rover emails, but you can unsubscribe from our newsletters and/or emails about our webinars and blog posts. If you export a screener, a readable version of the screener’s criteria will be listed at the end of the txt file. And that’s pretty much sums up the changes in our new release! We hope you’re as excited about this version as we are. As always, we’d love to hear from you, so send any questions, comments, or suggestions to feedback@stockrover.com. Happy researching!